This Chinese satellite photo shows an object in the southern Indian Ocean that might be debris from the missing Malaysia Airlines flight MH370 that disappeared with 239 people aboard in early March. This satellite photo was obtained by a Chinese Earth-observation satellite on March 18, 2014 and released by the country's State Administration of Science, Technology and Industry for National Defense on March 22. A Chinese satellite orbiting Earth has captured a new photo of possible debris from the missing Malaysian Airlines jet that disappeared with 239 people aboard earlier this month. The new Chinese satellite photo was captured by one of China's Earth-observation satellites on Tuesday (March 18) and released today (March 22) by China's State Administration of Science, Technology and Industry for National Defense (SASTIND). The image shows a large object in the southern Indian Ocean, according to a translation of the image description. The new satellite photo is the latest clue in the ongoing search for Malaysia Airlines Flight MH370, a Boeing 777 jet that disappeared on March 8 while flying from Kuala Lumpur to Beijing. Since the disappearance, the search effort has focused on two vast arcs, one stretching north from Malaysia up toward Kazakhstan in Central Asia, and another stretching south across the Indian Ocean. 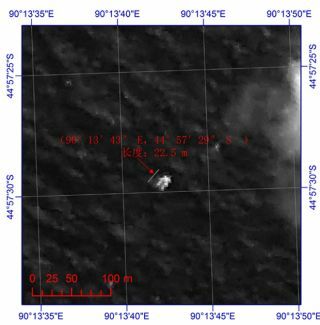 After an initial search of the potential debris location from the Australian satellite came up empty, search teams are now studying the Chinese satellite photo lead, according to press reports. Search and recovery ships are headed to the location to search for any debris, Malaysia Ministry of Defense officials said. The Associated Press reported today that two Chinese military planes arrived in Perth, Australia to join Australian, U.S. and New Zealand aircraft in the search. Search flights on Saturday also yielded no signs of the missing jet, and it is unclear if the search area will be changed in the wake of the new Chinese satellite photo, the AP reported.